Detailed Itinerary Sample of the 3 days / 2 nights (4 days / 3 nights including Caracas) Mini Adventure to Angel Falls. Airport arrival and assistance (if arriving in Caracas). Overnight by the airport or in Caracas. Transfer to the airport and assistance. Early breakfast at the airport. Flight to Canaima from Caracas via Puerto La Cruz or Ciudad Bolivar. 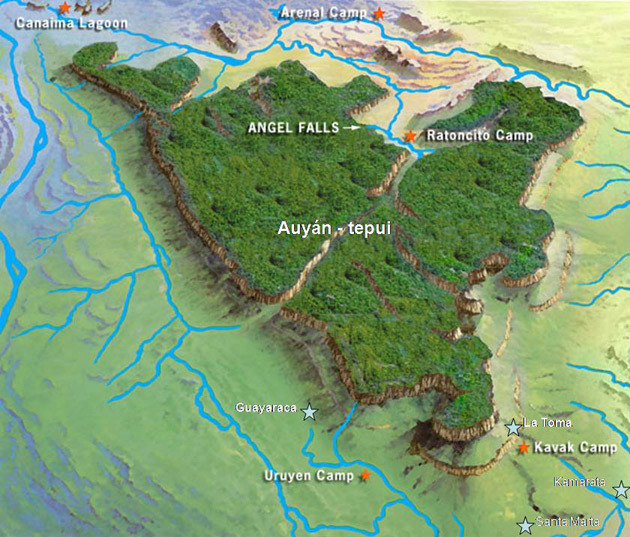 Angel Falls is located impenetrably deep inside Canaima National Park. Your tour begins with an impressive flight to the landing strip close to the “Laguna de Canaima”, from which you can see the beautiful Hacha Falls. After a tasty lunch in the indigenous village you will be taken across the lagoon and past the Hacha falls in a small dugout canoe. From the other side of the lagoon you will hike to the majestic Sapo Falls and take an exhilarating “hike” behind the gushing curtain of water. Dinner at a local lodge in beds. After an early breakfast at the lodge / camp you will be taken to Ucaima Port before taking a motorized canoe up river to Angel Falls. First stop Mayupa Rapids where you will disembark and hike to the meeting point on the river and pick up your curiara once more. A light lunch will be had once you reach a sandy bank along the Churun River and then on to Ratoncito Island and your camp for the night in front of Angel Falls. This afternoon you will hike to Laime’s Lookout Point at the foot of Angel Falls and perhaps get a chance for a welcome dip in “Lover’s Pool” at the base. Overnight in hammocks and dinner at the camp. After an early breakfast you will travel back down the river to the lodge / camp in Canaima where you will eat lunch before taking a flight over the jungle and tepuis back to Puerto Ordaz or Ciudad Bolivar and either back to Caracas or another destination of your choosing. If connecting to Caracas the flight will be early evening depending upon the airline being flown. End of service. Trips from 3 days (Angel Falls only) to 10 days available.